Mixpak Records released the Dre Skull produced Vybz Kartel album “Kingston Story” over the summer to much fanfare (Vybz Kartel Fader cover, New York Times feature, Dazed and Confused feature, etc). The album debuted at Number seven on the Billboard top-selling Reggae Album charts and the first single “Go Go Wine” received radio play around the world, getting support on Kingston radio, Hot 97, BBC Radio 1, and more. This fall Mixpak is finally ready to roll out "Half On A Baby," the second single from the album. 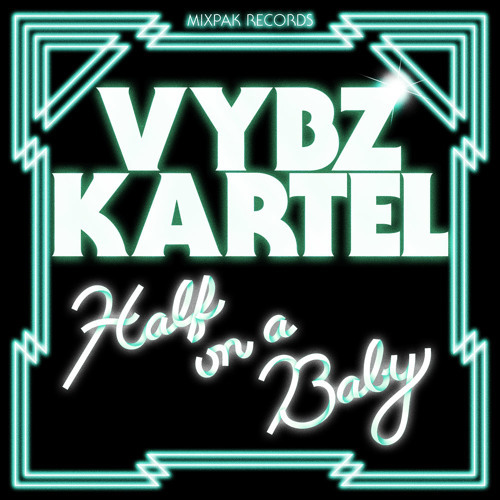 On it's own, "Half On A Baby" is a proper Caribbean dancehall/pop anthem, but when combined with remixes from some of the most exciting names in underground bass music it becomes something more. Recent Mixpak signee Dubbel Dutch takes "Half On A Baby" deep into the underground without losing sight of the melodicism that makes the original so enticing. Another member of the Mixpak fam, Schlachtofbronx, flips the track on it's head, turning it into a tempo-shifting Power Soca heavy hitter. Bert On Beats and Funkystepz hand in contemporary bass takes on "Half On A Baby", with the former going hard and the latter taking a more melodic, tropical approach. Finally, Mosca (Number, Night Slugs, etc) comes with a subtle-yet-banging remix that simultaneously references early-90's house and hyper-modern UK sounds. Mixpak is always dedicated to taking a fresh approach to music and culture and this remix package is further proof. Combining different worlds and genres and bringing together a Dancehall legend with rising underground talent, all done in the name of the next level. This is Mixpak Records.